Synopsis: Steven, a charismatic surgeon, is forced to make an unthinkable sacrifice after his life starts to fall apart, when the behavior of a teenage boy he has taken under his wing turns sinister. Between the disturbing Dogtooth and the quirky The Lobster, writer/director Yorgos Lanthimos has emerged as one of the most unique voices in independent film. And The Killing of a Sacred Deer may just be his masterpiece. The Killing of a Sacred Deer stars Colin Farrell (The Beguiled) as Dr. Steven Murphy, a heart surgeon who lives an idyllic life with his lovely wife Anna (Nicole Kidman from Lion and Stoker) and two perfect children Kim (Tomorrowland‘s Raffey Cassidy) and Bobby (Sunny Suljic from The Unspoken). The utopia is shattered when Steven befriends a strange teenager named Martin (Dunkirk‘s Barry Keoghan) who, at first, just seems like an introverted boy who is seeking a father figure following the death of his own. However, as Steven spends more time with Martin, the boy’s sinister motives are revealed which threaten to destroy the lives of Steven’s whole family. With The Killing of a Sacred Deer, Lanthimos and his writing partner Efthymis Filippou have crafted the same slow burn drama that audiences have come to expect from the duo. It takes some patience to get through it, but hang in there; after half a movie of setup and tension build, the inciting incident finally happens, and it’s all breathlessly downhill from there. In many ways, The Killing of a Sacred Deer is pure Yorgos Lanthimos. For those who are not enamored with his work, that will be negative, but fans of his will relish in it. The movie is full of the highly-scripted, deadpan-delivered dialogue and the sterile, emotionless situations for which the director is known, and it all builds towards an explosive climax that would seem out of character if it weren’t for the lit fuse that the viewer has been watching since the beginning. Most importantly, The Killing of a Sacred Deer feels like Yorgos Lanthimos is in complete control of his movie. For example, when Martin lays his figurative cards on the table, he does so with a mostly insensitive and clinical style, almost as if Barry Keoghan is reading right from the script as he throws down his gauntlet (it’s an “almost” because Koeghan does inject some subtle emotion into the scene, a testament to the brilliant restraint of his performance). His devious ways are just as methodical as Lanthimos’ direction. And the whole movie is like that. Lanthimos has a cinematic voice that is worth getting excited about, and The Killing of a Sacred Deer is the director at the top of his game. You can tell what you’re in for with The Killing of a Sacred Deer from the very first shot of an open-heart surgery procedure. That’s the kind of strikingly disturbing imagery that comprises the movie. The opening medical take is stock footage of an actual operation, but the rest of the film was shot by Yorgos Lanthimos’ usual cinematographer Thimios Bakatakis. 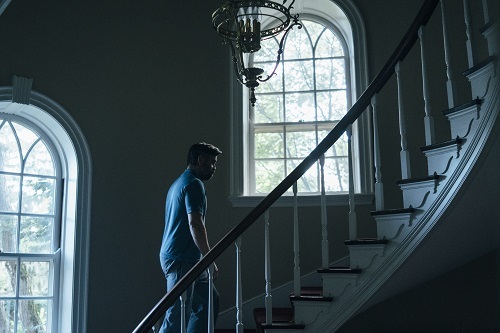 The Killing of a Sacred Deer is full of slow, deliberate camera motion and long, revealing takes that allow the action and conversation to unfold organically. It’s a bright movie, with even the nighttime scenes bathed in artificial fluorescent and halogen lighting. Bakatakis also makes use of window and mirror reflections to confuse and unsettle the viewer into not trusting their own eyes. It’s typical Lanthimos cinematic language, and Bakatakis’ photography is a huge part of it. Both the music and the sound in The Killing of a Sacred Deer are credited to Johnnie Burn (who did the sound design for Under the Skin as well as some of the music for The Lobster), and there’s good reason for that; the musical score and sound design are fully intertwined. The loud and abrasive score is made up of screeching violins, buzzing synthesizers, and thumping percussion, so it basically functions as an atonal soundscape. There are some more traditional sound effects throughout, and even some more traditional music (at one point, Raffey Cassidy’s Kim sings a chilling acapella version of Ellie Goulding’s “Burn”), but the most memorable and fascinating parts are when the music and sound combine into one big cacophonous mess. It’s genius. The Killing of a Sacred Deer is being half-represented as a horror movie in its marketing, but it really isn’t one. There are moments of genuine dread, and the character of Martin is absolutely ice cold, but that’s par for the course with Yorgos Lanthimos. When it comes to traditional scares, there are very few in the film. Most of the chills come from the unsettling atmosphere of the movie and from the handful of angry, violent moments. None of that can really be considered scary, though. It’s more simply disturbing than outright scary.